A friend of mine recently shared her struggle to get her kids to tidy their rooms. When I asked her if she gave them an allowance her response was charged with emotion. The average American nine year old is not gainfully employed. In America, the rules for employment for minors vary depending upon age and job specifications. However the general rule of the Fair Labor Standards Act (FLSA) sets 14 years as the minimum age for employment. It also limits the number of hours minors under 16 years can work. Labor exceptions apply for entertainment, newspaper delivery, and family farm work. A job, by definition, is work for pay. But Kelly’s statement naturally begs the question; does a child have a job? Call it a salary, commission, or allowance, should we pay our children? Are Chores a Kid’s Job? A household requires constant upkeep. Cleaning, cooking, tidying, doing laundry, whether paid to an outsider or done ourselves, are a common routine of life. Even at a young age, kids are mentally and physically capable of contributing to the household maintenance as well as cleaning after themselves. The child-centered Montessori methodology encourages age appropriate chores for children as early as 12 months. School-aged children are capable of raking leaves, loading the dishwasher, putting groceries away, walking the dog, and vacuuming. Paying for chores may come down to how exactly you define a chore. Parenting expert, Amy McCready author of If I Have to Tell You One More Time…The Revolutionary Program That Gets Your Kids to Listen Without Nagging, Reminding or Yelling, distinguishes between a chore and a contribution. “It’s the difference it makes to someone else.” Essentially a contribution is a help and a chore is compulsory. However when a parent defines a chore as a help – as opposed to a requirement - to the family, it reframes the motivation behind the act. Helpful acts could be paid because it is not required. Personal finance expert Suze Orman states, “Allowance is earned, not given.” She encourages paying our children for chores and not good behavior. In that view, a chore is a help that is worth payment. Good behavior shouldn’t need a bribe. Parents pay an allowance because it is earned for tasks not required. Chores teach life skills and help with self-esteem. They demonstrate that all family members participate and have a share in the household. If responsibility shows ownership then payment demonstrates a clear voluntary transaction. Rob Lieber shares in his book, The Opposite of Spoiled: Raising Kids Who Are Grounded, Generous, and Smart About Money, that kids should do chores for free, the same way adults do. He’s not opposed to allowance but instead linking allowance with chores. “If you do, there will come a point when your kids have enough money and decline to do chores.” Fair point. If chores are for pay and pay is not wanted, then what? Those tasks still need to get done. Beth Kobliner, author of the book Make Your Kid a Money Genius (Even If You're Not): A Parents' Guide for Kids 3 to 23, qualifies that it’s fine to pay for extra work when kids want spending money. These are jobs that otherwise would be hired out like pool cleaning or mowing the lawn. Is School a Kid’s Job? Today, even in untraditional roles of a family household, every parent has a job. A father and mother are likely to work outside the home (63% according to Pew Research Center). But even when a stay-at-home mom (or dad) doesn’t leave for external employment, she still has a job. There are meals to make and pack, endless clothing and grocery shopping to do, constant entertainment and education of the children, among a list of a thousand other untracked tasks to meet the family’s range of basic to frivolous human needs. I’ll repeat, every parent has a job of some form. In America, education is a right and required by law. Children are entitled to an equal educational opportunity at a basic public elementary and secondary institution though many parents alternatively opt for private school or homeschooling. If every child, starting at age 6, receives a compulsory education, the American government essentially considers school every kid’s job. Each morning the family scatters like billiard balls to different corners of their world. Parents head off to their places of employment, stay-at-homers tend to the family needs, and children go to school. We meet our day head on and we come back home, rinse and repeat until school year end. If our children cannot work for hire and are required to attend school, should we pay them for good performance? Further, in the teenage years when employment is an actual option and sports and club activities compete for precious afterschool time, should we pay for grades to direct attention to education? Just about half [49%] of parents say they give an allowance for good grades, according to a 2017 KRC Research poll. Makes sense as grades are easily tracked. Someday these learned children will become competitive and productive members of adult society. Incentivizing an extra effort to increase a competitive edge and hopefully move them faster out of the basement apartment is entirely logical. But many parents believe a good grade - not the money– is the carrot. In his book, Punished by Rewards, Alfie Kohn summarizes evidence that “rewards simply do not work to promote lasting behavior change or to enhance performance.” He argues that rewards shift the subject’s (in this case student’s) attention on the incentive and away from the thing-to-be-desired (the grade). In doing so, the intrinsic value muscle of accomplishing the grade is not flexed. Performance requires award because self-driven motivations are not encouraged. ‘Pay for grades’ confuses the lesson: the ‘A’ is the reward for a job well done, come naturally or applied. Back to the idea of ‘kids are not employees’. Money is not just salary; it’s also incentive. Parents use allowance not to pay their child employees but prioritize energy in the direction they see fit. Allowance is a teaching tool in the support of values. It’s an alternative to yelling and punishment. For me, money has always been about independence. As a child, having money meant not needing to beg my parents. As an adult, money provides choice – the more money the more choices available. I can recognize the frustration of full dependency on a parent or caregiver for not only needs but also wants. I remember being a child! As I grew up I felt more independent but a lack of money exposed my actual level of self-determination. I am one of the 67% of parents who give an allowance to their kids, according to a 2017 KRC Research poll. Allowances provides a regular opportunity for kids to make financial decisions and learn from them. Better to make mistakes with $25 at age 10 then ruin their own credit at age 25. It should start young because if not now, then when? Allowance, in my house, is paid (not given) for a job done well. My kids’ jobs are to learn and grow. Grow is defined as taking good care of their own bodies. They eat a variety of foods and finish their meal. They go to the doctor and get their vaccines. They are physically active at play and sports. The kids wash as often as possible. Learn applies to the mind, accomplished through study and practice. Chores teach life skills and as a necessary part of living in our household are therefore necessary for each member to contribute. They attend school and finish homework. Grades aren’t a concern as much as best effort. Embracing Carol Dweck’s growth mindset message, I use allowance to reinforce excellence in the process of childhood as opposed to the daily results. I pay the kids for good household standing at the end of the week. Payment and lack of payment is not connected to any one chore or grade. I’m training my kids to one day become competent adults. I don’t assign the chores I don’t want to do. 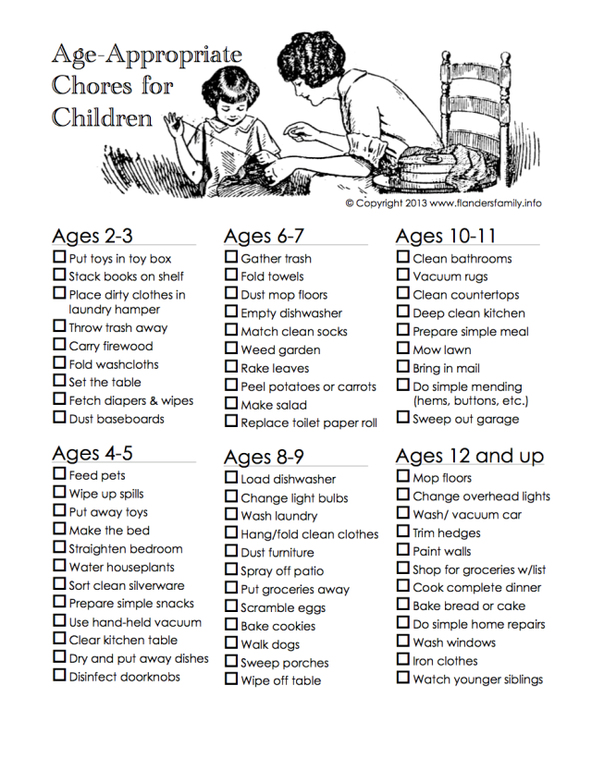 The chores are the age appropriate lesson they need to master. I award my kids, in good household standing, to learn and grow. They are paid for a job well done - meaning to their best ability and without irritating resistance. If they did their part then they deserve a small piece of sweet independence too. Newer PostAnnouncement of my 2 books!